of sound editing, effects, virtual synthesizers, etc., and along with these ... The later Beethoven sitting on a park bench with an ..... Vienna: Springer-Verlag Wien. 42. Single Stroke Rudiments. 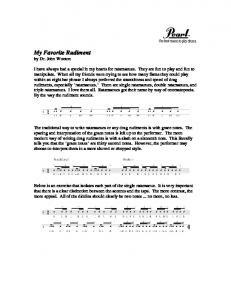 Drum Roll Rudiments. 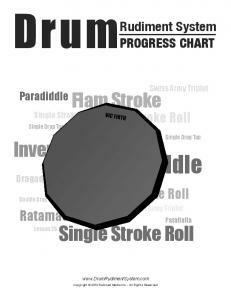 Paradiddle Rudiments. Single Stroke Roll. Single Stroke Four. Single Stroke Seven. Multiple Bounce Roll. is on institutions that link production and consumption: concepts of musical ..... were struggles about the status of composers and between opposing schools, the. Jan 15, 2018 - The model performance is experimentally validated with a whole-life experiment of a rolling bearing. .... The higher the monotonicity is, the greater the fitness ...... 1000 2000 3000 4000 5000 6000 7000 8000 9000 10000. 0. Jan 27, 2014 - website of opera festival lists 8 opera festivals in. Austria, 7 in ..... visitors and others are often no more than cheap talk), but there is much to be said .... term impact of hosting the Olympics, Economic Inquiry 50, 754-772. Serie: Teoría y práctica del teatro nº19. DELORS, J. (1996). La educación encierra un tesoro. Madrid: Santillana. JOUVET, L. (1952). Réflexions du comédien. 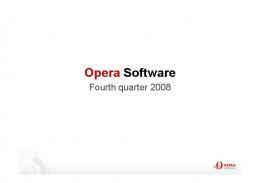 correctness or completeness of the presentation, and neither Opera Software ASA nor ..... Web 2.0 applications and services ... downloads .... Nokia 3110 classic. 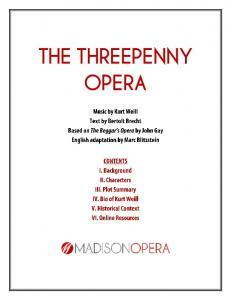 The work's origins lay in John Gay's 18th century ballad opera,. The Beggar's Opera. .... The street singer returns again, with the Ballad of Mack the Knife. 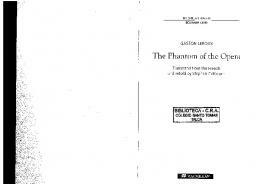 Leroux's most famous story, The Phantom of the OPera, ... Christine sang and her father played his violin. ... Again, the old man played the violin and Christine. 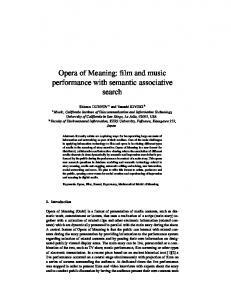 Abstract:Music is the core power to promote the development of opera and to thoroughly understand its early form and development track in the domain of opera art. 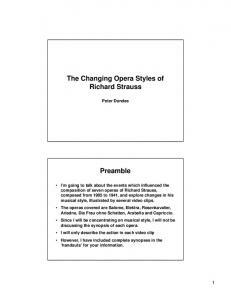 It plays an important role in the comprehensive understanding of the artistic nature of opera music. Opera music originated from the inheritance of excellent music culture in history, the song and dance drama in Tang Dynasty, Zaju in the Song Dynasty and Jinyuanben (a kind of Chinese ancient traditional opera) had began to form the rudiment of opera music before forming into independent musical system. The reform of the development of the opera music is based on the prototype of the opera music, with the development of the music itself and the combination of the opera art produced by external conditions of the dual effects. he formative period of opera music has always been a topic constantly discussed by music circles. The main reason is that the three significant marks for opera art, namely, the appearance of the concept of "opera", the formation of first-person narrator singing art and the perfection of the opera music system, are not established at the same time. In terms of opera music, it is a kind of complicated music system that has experienced constant development and changes after nearly one thousand years and is extracted and purified from those excellent achievements such as folk songs, rap and song and dance, and the existing vocal cavity dramas are diversified and with their own characteristic. Therefore, this article takes the early rudiment, transformation and fusion of opera music as the entry point to collate its development to thoroughly understand its development track and nature comprehensively. scale song and dance in Tang Dynasty; Cuoqu Bomei and Zheng Sheng met Drakan Bomei, the Dragon Lady, Zaju in Song Dynasty, and Bomei, large-scale song and dance in Tang Dynasty, etc. Though there's no script and score handed down from ancient times, we can know that Zaju in Song Dynasty has borrowed music from Liuyao, Liangzhou and Bomei, etc. of large-scale dance accompanied by music in Tang Dynasty In conclusion, the early rudiment of opera music can be roughly divided into two types: the first type is music in other artistic forms with the characteristics of opera art, such as the song and dance drama in the Tang Dynasty. It is a kind of song and dance, but due to there is plot in it, the "drama" appears. The second type is that it borrows other music as the song in the drama, such as Yongjia Zaju, Zaju in the Song Dynasty, Jinyuanben. The primary rudiment of opera music can be summarized into the following stages: the opera in the song and the story played by the "borrowed" song. The dramatic music with independent artistic value, different from other music forms, has not been truly formed. ical development, including the political, economic and dramatic rheology. Second, the fusion of opera music is the demonstration form that integrates the previous internal reforms of drama and music. It is the music reform of higher level. Kun opera and Beijing opera are the splendid pearls in the dramatic history of China. They are the classic examples that integrate the excellent results of opera music reform in the development process. tunes of the southern drama. Secondly, he learns from the excellent results of northern drama. Wei Liangfu and Zhang Yetang, who reform the Kun Opera along with him, first learn the northern drama and then the southern drama, which provides the important conditions for the Kun Opera to integrate the essences of the south and north art. Apart from integrating the music advantages of the northern drama with the southern drama in music reform, which is mentioned in the previous part, Wei Liangfu's advocacy of "singing the northern drama in the southern form" also applies the pure tune of the southern drama to the singing of the northern drama. It is safe to say that Kun Opera at this time has integrated the essence of the south and north tunes. Under the background of the south-north assemble formed by the relatively unified political pattern in the Yuan and Ming Dynasties, the internal momentum of opera tune's pursuit of changes and the team headed by Wei Liangfu that master the northern drama and are devoted to the music reform of southern drama make the Kunshan Opera stand out among the three tunes in the long reform process, thus becoming the "great drama" integrating the north and south art essences. If the southnorth assemble in the early stage of Yuan Dynasty draws the curtain of the fusion of opera music, the Kun Opera reform by Wei Liangfu leads to one generation of Kun Opera on the basis of inheriting the trend of music fusion, thus forming Kun Opera's governing status in the dramatic stage for more than 200 years (1570-1800) and making the first national tune opera of the real sense in the opera history of China. 3.2 The Second Fusion of Opera Music At the intersection point of the Ming and Qing Dynasties, although Kun Opera is still the mainstream of opera art, yet it gradually stays away from the common audience out of its difficult tune and lyrics, thus having the tendency of decline. Meanwhile, the local tunes appear in the north, which is the prosperous place of Zaju in the Yuan Dynasty, thus changing the situation that Kun Opera "unifies the whole country". In the Qing Dynasty, the new four tunes of "Kun in the south", "Yi in the north", "Liu in the east" and "Bang in the west" appear after the four tunes in the Ming Dynasty. The fusion of the tunes after the first integration of opera music embodies the inner request for "changes" of opera music. As is said, long period of division must lead to integration. In the constant dissemination process of opera music, it begins the new-round reappearance from division to integration. In this process of big fusion, opera music has undergone the following several important reforms. has utterly solved this problem through the advantage of integrating multiple tunes into one, which has not only solved the inconvenience brought by the vocal difference of male and female voices in singing, but also provided the greatest space for fully depicting the character image, expressing the plot and strengthening the music expressive force. In the 21st century, opera seems to enter a relative "low ebb" stage again. Just like each reform of the opera music system, when it develops to the extremity, it is bound to bring its own limitations and insufficiency. It requires the internal reform, the exchange and fusion of music to generate the opera music system that keeps in line with the requirements of the times. Seen from the wide view, the two fusions of the opera music are the huge achievements of the replaced and existing systematic tunes in music, which have been combined and separated again and again. By absorbing the quintessence and removing the dross, it leads to the prosperity and splendor of the dramatic art and forms the epoch-making representative drama of the dramatic art—Kun Opera and Beijing Opera. The symphony of opera music in the last century has substantially drawn the prelude of the new reform of opera music, which is the individual artistic phenomenon of the "ongoing" development of dramatic art. It is not appropriate to affirm whether the symphony of opera music is the future development orientation of opera. However, the all-embracing and energetic dramatic art is seeking for the re-appearance of "the new sounds" in its own reform. If the first two fusions in the dramatic history are the local fusion of the north and south in China, in the current days when the world music is widely exchanged, the reform of opera music is bound to be the western and Chinese fusion of "making foreign things serve China". cated process. Records of the historical materials and the coarse researches cannot elaborate on it. But seen from the reform of each success and the entire development track, the development of opera music has rules to follow. From the division of "head, belly and tail" of world cavity, to the gradual establishment and re-establishment of the opera music system, and the two north-south fusions, the opera music keeps turning from popular to elegant, from elegant to popular. It is integrated and then separated, separated and then integrated, which embodies the music development mode under the dual function of the internal momentum and external integration. The viewpoint of Li Yu, the drama theorist in the Qing Dynasty, is cited here again: "Change leads to newness and invariability leads to corrosion; change leads to vitality and invariability leads to rigidness." In the 21st century, where is the road of opera music? It should be the reform and re- fusion on the basis of inheritance of "turning the ancient tones to the modern tones"
Report "Discussion on the Rudiment, Transformation and Fusion of Opera Music"